The Traffic Police have installed two no-parking sign boards long time ago alongside Kamakshi Hospital premises and yet, the illegal parking of cars is noticed day-in and day-out violating the traffic rules (see picture). Apparently, these signages have lost its significance with vehicle owners hardly abiding by it. Since the Traffic cops are turning a blind eye towards this violation, the Department must remove the existing no-parking sign boards from the premises. 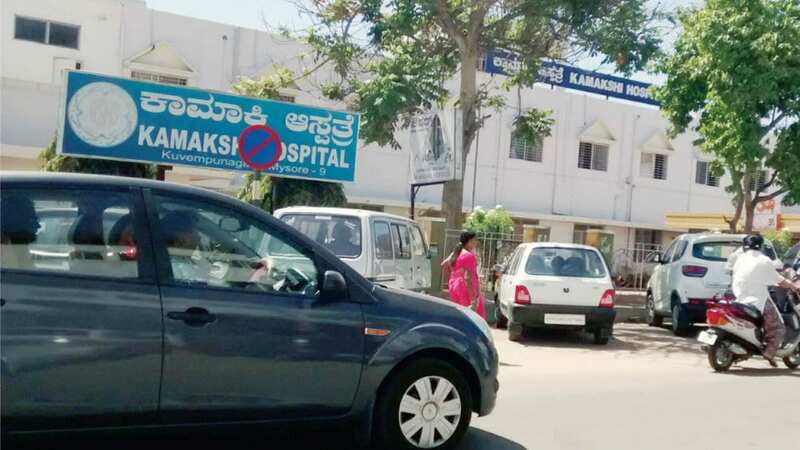 Recently, Sigma Hospital has come up right opposite Kamakshi Hospital and this has led to parking of rows of cars on either side of the road and frequent removal of cars from the parking area by the hospital visitors is an obstacle for easy traffic flow. Also, it is unfortunate that the bus shelters that were existing has now mysteriously disappeared along with the ITS-LED display boards (might have gone to the scrap yard by now). It is painful to see many elderly and sick people and students who stand under the blazing sun waiting for the bus. Therefore, the KSRTC and MCC authorities must immediately consider providing bus shelters at two appropriate locations on this road. If the MCC has a lease-period issue with the private contractors /advertising agencies, it should stop such bad protocols and hasten up the process of replacing the shelters at the earliest.